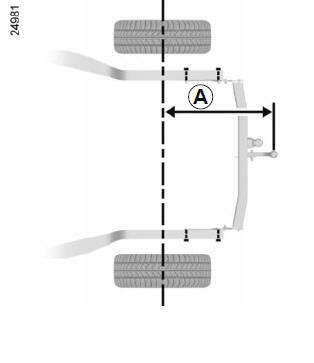 Permissible nose weight, maximum permissible towing weight, braked and unbraked: refer to the information on “Weights” in Section 6. For fitting and conditions of use, refer to the equipment’s fitting instructions. A: 697 mm (5-door version). A: 697 mm (Utility version). A: 948 mm (Estate version). If the towbar ball obscures the registration plate or the rear fog lights, it should be removed when not in use.